This image, one of the first obtained by NASA's Dawn spacecraft in its low altitude mapping orbit, shows part of the rim of a fresh crater on the giant asteroid Vesta. The terrain shown here is located in an area known as the Heavily Cratered Terrain in the northern hemisphere. NASA's Dawn spacecraft has taken its first close-up images of the giant asteroid Vesta, revealing the space rock in a wealth of new detail. Dawn recently entered its lowest orbit yet around the rock, which lies in the asteroid belt between Mars and Jupiter. The cozy orbit is allowing the spacecraft to observe new details about a body that scientists think could have been a planet, had things developed differently. Small grooves, lines and dimples along Vesta's surface are revealed in the new photos, potentially giving astronomers clues about the space rock's history, as well as the history of the solar system as a whole. The asteroid is covered in craters from impacts of smaller asteroids in the crowded debris field where it orbits. This close-up photo of the asteroid Vesta taken by NASA’s Dawn spacecraft shows a part of one of the troughs at the equator of the asteroid. In the image, the floor of one of the equatorial troughs appears as the brighter deposit at the bottom of this image, contrasted against the darker band of the trough edge. Dawn beamed the new images to Earth on Dec. 13, and NASA released them Wednesday (Dec. 21). Dawn entered its closest orbit on Dec. 12, spiraling down to an altitude 130 miles (210 km) above the asteroid's surface. Scientists plan to keep the probe there for about 10 weeks, before sending Dawn back up higher to observe with a wider field of view again. 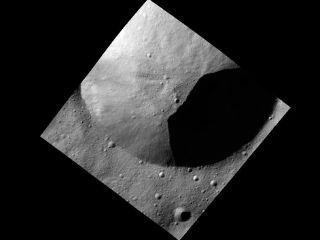 While in this lowest orbit, researchers hope Dawn collects data to shed light on the composition of Vesta's surface and its interior structure. The spacecraft will take optical photos, as well as measurements of gamma-rays and neutrons from the surface. Vesta is the second most-massive body in the asteroid belt, with a width of about 330 miles (530 kilometers). It's what's known as a protoplanet, because if Jupiter's gravity hadn't swept away nearby material as the solar system was forming, scientists think Vesta could have developed into a full-fledged planet. The $466 million Dawn probe launched in 2007 on a mission to study Vesta and another intriguing space rock, the dwarf planet Ceres. In July 2012, Dawn will depart Vesta and head for its new target, where it's expected to arrive by February 2015.